Roche K.A. (2015) Food Labeling: Applications. In: Caballero, B., Finglas, P., and Toldrá, F. (eds.) 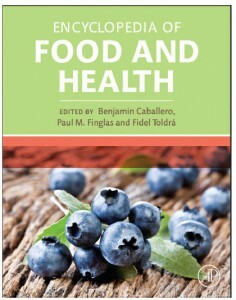 The Encyclopedia of Food and Health vol. 3, pp. 49-55. Oxford: Academic Press. Abstract: Food labels in Europe are governed by the Food Information to Consumer (FIC) regulation 1169/2011. There are 12 mandatory pieces of information that must be present on all European Union (EU) food labels: product name, list of ingredients, allergens, quantitative ingredient declaration, net quantity, durability dates, storage, instructions for use, business name and address, country of origin, nutritional declaration, and alcoholic strength. The mandatory information must be presented in a minimum font size. The labeling of food products in some non-EU countries is also discussed and examples of similarities or differences compared to EU food labels.